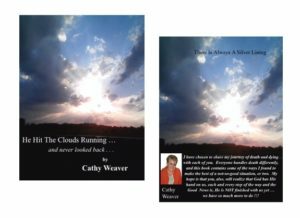 My second book, “He Hit The Clouds Running …… and never looked back ……” was my rendition of what it feels like to have people you love, leave !!! Death is just a part of life … He is in a better place … She is no longer suffering … You will love again … Time heals all wounds … Many times, the people who spout these cliche’s are just trying to help you ‘feel better’ when they know you are hurting with your loved one’s passing. People usually mean well, but the discomfort that the subject of Death can cause is sometimes overwhelming to many of us. Does a ham make you feel better, or a chocolate cake or a glass of wine ??? Gifts and cards and flowers often make the giver feel like they are ‘doing their part’ to help with your grieving process. Sadly, when a death in the family occurs, emotions tend to take over and sometimes, angst and dissension take place. As I have said, people usually mean well but the pain of death can be rough to deal with. I have been blessed with songs like “Someone Is Missing At Christmas” and sayings and gifts about “The Empty Chair” and now I have learned that my book has been a Blessing to others as well.